Soolaki, M., Arkat, J. (2018). Supply chain design considering cellular structure and alternative processing routings. 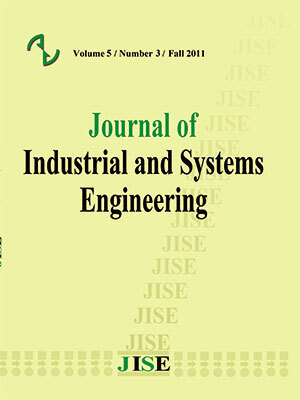 Journal of Industrial and Systems Engineering, 11(1), 97-112. Majid Soolaki; Jamal Arkat. "Supply chain design considering cellular structure and alternative processing routings". Journal of Industrial and Systems Engineering, 11, 1, 2018, 97-112. Soolaki, M., Arkat, J. (2018). 'Supply chain design considering cellular structure and alternative processing routings', Journal of Industrial and Systems Engineering, 11(1), pp. 97-112. Soolaki, M., Arkat, J. Supply chain design considering cellular structure and alternative processing routings. Journal of Industrial and Systems Engineering, 2018; 11(1): 97-112. Nowadays, in highly competitive global markets and constant pressure to reduce total costs, enterprises consider group technology and Supply Chain Management (SCM) accordingly and usually separately as the key elements for intra and inter facilities improvement. Simultaneous consideration of the elements of these two disciplines in an integrated design can result in higher efficiency and effectiveness. A three-echelon supply chain that has several markets, production sites, and suppliers is designed again in this paper as a Cellular Manufacturing System (CMS). Every product can be manufactured in the CMS through alternative process routings, in which machines are likely to fail. A linear integer programming model is presented here that seeks to minimize the intercellular movement, procurement, production, and machine breakdown costs. We present a number of illustrative examples to demonstrate the effectiveness of the integrated design. The proposed examples reveal that although the procurement and logistics costs increase slightly in the integrated design, the total cost is dropped considerably. Aalaei, A., &Davoudpour, H. (2016a). Revised multi-choice goal programming for incorporated dynamic virtual cellular manufacturing into supply chain management: A case study,Engineering Applications of Artificial Intelligence, 47 (3–15), doi: 10.1016/j.engappai.2015.04.005. Aalaei, A., & Davoudpour, H. (2016b). Two bounds for integrating the virtual dynamic ellular manufacturing problem into supply chain management, Journal of Industrial and Management Optimization, 12 (3), 907–930. Ahkioon, S., Bulgak, A. A.,&Bektas, T. (2009). Integrated cellular manufacturing systems design with production planning and dynamic system reconfiguration, European Journal of Operational Research, 192, 414-428. Arkat, J.,Abdollahzadeh, H., & Ghahve,H. (2012). A new branch and bound algorithm for cell formation problem, Applied Mathematical Modelling, 36 (10), 5091–5100. Balakrishnan, J.,&Cheng, C. H. (2005). Dynamic cellular manufacturing under multi-period planning horizons, Journal of Manufacturing Technology Management, 16, 516-530. Bhide, P., Bhandwale, A., & Kesavadas, T. (2005). Cell formation using multiple process plans, Journal of Intelligent Manufacturing, 16 (1), 53–65. Chung, S.H., Wu, T.H., & Chang, C.C. (2011). An efficient tabu search algorithm to the cell formation problem with alternative routings and machine reliability considerations, Computers & Industrial Engineering 60, 7–15. Defersha, F., &Chen, M. (2006). A comprehensive mathematical model for the design of cellular manufacturing systems, International Journal of Production Economics, 103, 767-783. Jabal Ameli, M.S., Arkat, J., &Barzinpour, F. (2008). Modelling the effects of machine breakdowns in the generalized cell formation problem, International Journal of Advanced Manufacturing Technology, 39 (7), 838–850. Jain, V., Wadhwa, S., &Deshmukh, S.G. (2007).Supplier selection using fuzzy association rules mining.International Journal of Production Research, 45 (6), 1323-1353. Jain, V. (2006) Hybrid approaches to model supplier related issues in a dynamic supply chain, Ph.D. Mechanical Engineering Department, Indian Institute of Technology Delhi, India. Kasilingam, R.G., &Lashkari, R.S. (1991).Cell formation in the presence of alternate process plans in flexible manufacturing systems, Production Planning and Control, 2 (2), 135–141. Kisomi,M.S., Solimanpur,&M.,Doniavi, A. (2016). An integrated supply chain configuration model and procurement management under uncertainty: A set-based robust optimization methodology, Applied Mathematical Modelling, 40 (17–18), 7928–7947. Mohammadi, M., & Forghani, K. (2014). A novel approach for considering layout problem in cellular manufacturing systems with alternative processing routings and subcontracting approach, Applied Mathematical Modelling, 28 (14), 3624–3640. Rao, P., &Mohanty, R. (2003). Impact of cellular manufacturing on supply chain management: exploration of interrelationships between design issues, International Journal of Advanced Manufacturing Technology Management, 5 (5-6), 507–520. Rasti-Barzoki,M.,&Hejazi, S.R. (2015). Pseudo-polynomial dynamic programming for an integrated due date assignment, resource allocation, production, and distribution scheduling model in supply chain scheduling, Applied Mathematical Modelling, 39 (12), 3280–3289. Saxena, L.K., &Jain, P.K. (2012).An integrated model of dynamic cellular manufacturing and supply chain system design,International Journal of Advanced Manufacturing Technology, 62(1–4), 385–404. Schaller, J. (2008). Incorporating cellular manufacturing into supply chain design, International Journal of Production Research, 46 (17), doi: 10.1080/00207540701348761. Wemmerlo, U.,&Hyer, N.L. (1989). Cellular manufacturing in the U.S. industry: A survey of users, International Journal of Production Research, 27 (9), 1511–1530.